What’s Next for Bellingham & Whatcom County’s Real Estate Market in 2019? Reviewing the numbers for 2018 and where things appear to be headed in 2019, I see a tale of two markets. In town, we are still seeing very strong demand, and low inventory, compared to this time last year. And with a recent drop in interest rates again, all signs point to a very busy early spring market in Bellingham. Perhaps not as much frenzy and as many multiple offers as last spring…but don’t be surprised if prices jump another 5% by the end of the spring! Particularly in the under $500k market. Quite simply, our population continues to grow, and new housing is not catching up to demand. What there is in new construction, is primarily in the $500k to $700k range. In this price range, buyers will continue to have more options. But under $500k, supply is so limited, I don’t see anywhere for prices to go except up further in the spring. See inventory levels below. A 2 month supply is holding steady in Bellingham, and a 3 month or less supply is a sign of a SELLERS market still. In Whatcom County rural areas though, things look a little different. You can see the Whatcom County chart has a different trend to it than the Bellingham one. 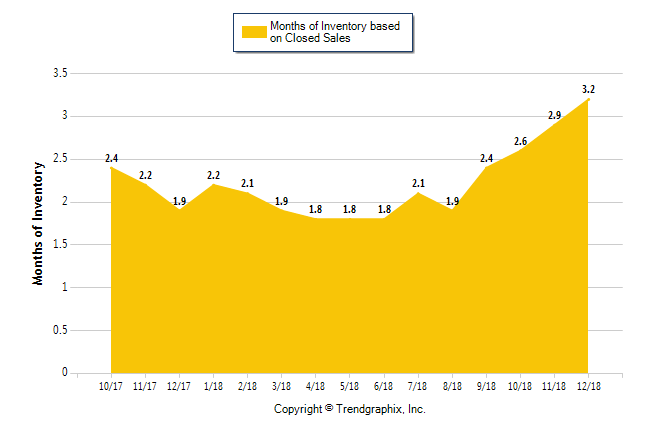 There was a clear uptick in inventory, and a slight decrease in sales activity, leading to a trend now of 3.2 months. And that trend looks to be on the path of increasing (more inventory and higher supply in Whatcom County). 3 to 5 months of inventory would signal a balanced market. 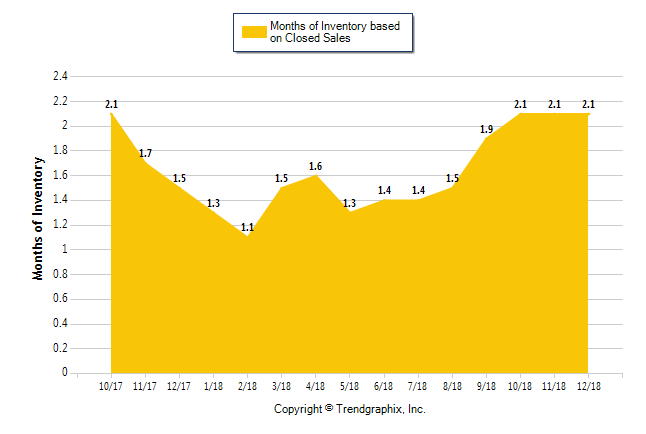 (months of inventory being how many homes are for sale today, divided by how many are selling every month–example 90 homes for sale, and 30 selling every month is a 3 month supply). Bellingham under $500k is still a HOT market. Bellingham over $500k is still a strong market, but buyers will have more options to choose from, and more negotiation room this year than last. But Whatcom County is converting to a more balanced market. Buyers looking in Ferndale, Birch Bay, Blaine, Everson, Nooksack, Lynden and Maple Falls, should see an increase in options, and have more negotiation power again this year. And prices should be relatively flat this year in these markets. The only exception to this is the under $300k price range. If you’re a buyer waiting for a good deal under $300k, I wouldn’t wait. Affordable housing will remain an issue for the fore-see-able future. And even if things slow down later this year and prices slump a little bit in the outskirt areas….this could be off-set byrising interest rates. Rates are down temporarily under 5% again, but almost every economist is predicting rates back over 5% soon. It should be an awesome year for Real Estate in Bellingham and throughout Whatcom County. A strong market, but a slightly more balanced market is good for our community, and both buyers and sellers.